One of metro Atlanta’s loveliest suburban downtowns is tucked away from the sprawl between Peachtree Industrial Boulevard and Buford Highway in Gwinnett County, just out of view of motorists. Founded in 1870, historic Norcross is less a vestige of yesteryear than a thriving city center that happens to have a barber pole and a train depot. New landscaping, brick crosswalks, and twinkling tree lights have beautified the downtown in recent years. Find all the staples—coffeehouse, tavern, antiques store, quirky shops, community theater—plus an authentic Cuban restaurant, Mojitos (35 South Peachtree Street). Day-trippers should grab lunch at Bleu House Market (62 College Street). 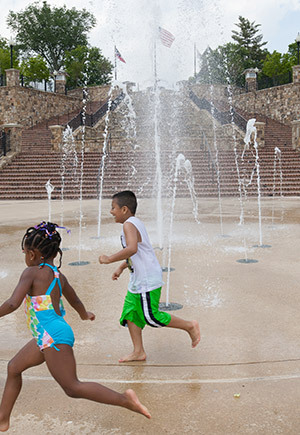 Bookending downtown are Lillian Webb Park, with its stunning stepped fountain and splash pad, and historic Thrasher Park, where trains trundle by. Victorian, antebellum, and Craftsman homes surround the retail district. More than 200 homes will break ground in 2014 and must meet rigorous guidelines to maintain the historic flavor. One such development is Adam’s Vineyard, to be built around decades-old muscadine vines planted by the late Colonel John Adams, a community stalwart. The historic district has provided a bucolic setting for A Walk in the Woods, starring Robert Redford, and ABC’s Resurrection. Nearby, The Hunger Games: Mockingjay and Fast & Furious 7 took over an unused industrial lot. At press time, the Jacoby Group expected to close on the lot in August, with plans for the largest media production complex outside California. Ratings versus national averages by NeighborhoodScout.com. NeighborhoodScout.com is the most widely used neighborhood search engine in the world. It is owned by Location Inc., a leading builder and source of location-based data and tools for businesses and consumers nationwide. This article originally appeared in our July 2014 issue.